Editor’s note: There are a lot of great posts in the archives here at Life Your Way that don’t get much attention anymore, so I’m sharing a couple of my favorites each week. As the mother of several “picky” children, I always appreciate Shaina’s approach to food with her children! My husband and I do our grocery shopping and our cooking with all four of our children. We don’t do it because having four kids — usually with one in a sour mood — at the grocery store or the farmers market is overly enjoyable, and yet we do it. We make the trip and bring them all with us because it’s important to us, and we make it a priority. The lessons that my children learn coming with us to buy our food, gardening in the backyard and cooking with us are lifelong and essential. As we stand in the aisle at the supermarket and make decisions about what to put in the cart, they’re learning how to care for and nourish their bodies. Lifelong Learning. My kids are learning to feed themselves. From growing their own food to deciding what food will enter their body, they are learning how to be informed consumers and to make decisions based on more than just cravings and convenience. Familiarity Trumps Fear. By having your kids involved from the start, you’re setting them up to recognize what is on their plate and served at dinner. When my 10-year-old says she doesn’t like asparagus, I know she’s tried it several times and actually eats it with us on a regular basis and has formed this opinion because she really has an aversion towards it. I can respect that, but I would also expect that if she were a guest in someone’s home that she is able to eat a few bites and be polite about what she is served. Foster Independence. We encourage our kids to be involved in the food planning process so they can choose side dishes or snacks or entrees they enjoy eating. When they sit down to a meal that they had a part in planning and preparing, they are so proud and excited. Getting kids excited about food is a great way for them to explore who they are and encourage them to form opinions and make decisions for themselves. While the process of cooking with your kids may not always be the easiest and most exciting thing to do, I view it as any other part of parenting. When I take my kids to the zoo there are often moments of stress as one child lags behind because they haven’t had enough time with their favorite animal or another one wants a snack and whines, yet I continue to bring them to the zoo to see the animals. Likewise, sometimes when we sit down to read stories at night the kids are squirmy and disinterested or they argue over which book to read, but I still read to them every day rather than getting discouraged and quitting. Sure, sometimes we give up and don’t read that night because the kids are too tired or too distracted to get anything out of it, but that doesn’t discourage us from sitting down the next night with a book and starting the process over again. In that same way, I head to the store with my kids and dig up the garden in the spring; we encourage them to enter the kitchen and help when and where it’s appropriate as we make dinner, bake cookies or serve meals. 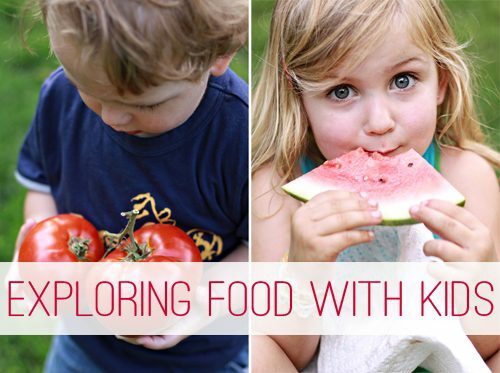 I hope you’ll consider embracing food as an essential lesson along the parenting path as well. What are some of your favorite foods to cook with your kids? Do you have any memories of cooking and baking with your family as a child?